Located along the Mississippi River about 80 miles inland from the Gulf Coast, Baton Rouge is home to multiple prominent industries including public service, education, industrial, film, and medical. The second largest city in the state with an estimated population of 835,400, the “Red Stick” city has a unique history and takes great pride in its blend of cultures, great food, and festive lifestyle. Serving as the state capital and political center of Louisiana, the largest employer in the “capital region” is the State of Louisiana. 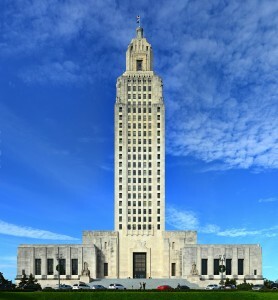 Standing at 34 floors high, the Louisiana State Capitol Building is a popular tourist attraction where thousands of state employees work. The Louisiana Old State Capitol is still around as well and is another place many visit to appreciate the beautiful Gothic architecture and absorb the historical significance. Due to a boom in petrochemical industry at the turn of the century, Baton Rouge expanded away from its central area. The largest private employer in the area is Turner Industries’ headquarters, a company which has its hands in building, servicing, and maintaining the industrial sector nationwide. One of Baton Rouge more well-known claims to fame is the original Raising Cane’s Chicken Fingers restaurant. Still in Baton Rouge today, this original location is a popular place for many visitors who are familiar with the fresh chicken. This expansive chicken restaurant with humble roots now has Raising Cane’s River Center arena, which hosts a diverse range of shows within downtown Baton Rouge. Although Baton Rouge is home to many large-scale prominent employers, innovation is highly encouraged in the Baton Rouge community in order to make Louisiana more competitive and relevant on the national stage. Louisiana Technology Park is a business incubator founded with the purpose of fostering innovation within the community. With over 20 startups, all at different stages of their development, the brick and mortar location in Baton Rouge provides funds and resources to their partners. Home to Louisiana State University flagship, education is another major sector of the economy in Baton Rouge. In fact, LSU Innovation Park provides local businesses and entrepreneurs incentives to help foster technological growth in the area, which is part of the cause of the recent boom of start-ups in the area. Innovation Park is a great example of the city bridging industries and coming together to improve not only innovation but life, in the capital area. In addition to the educational powerhouse LSU, Baton Rouge is home to Baton Rouge Community College, Southern University, and Our Lady of the Lake Regional Medical Center teaching hospital. Which demonstrates how the area is bridging the thriving education and medical industries. Some smaller startups have taken advantage of the prominent medical industry of the city. For example, LocalMed is a company which provides marketing and scheduling software to healthcare providers. Another prominent industry in Baton Rouge is film and production. Due to the taxes being some of the lowest in the nation for these types of creators. The city celebrates and rewards it’s creators annually at the Red Stick International Animation Festival — which is rebranding as Red Stick International Digital Festival in 2018 to accommodate a broader selection of digital medias. This rebranding of the Red Stick Festival is echoing a larger movement of the technology and media industry in the area, growing rapidly. With gaming startups such as Focus Digital Design, a digital product marketing firm rendering 3D animation for clients, or Pixel Dash Studios, which develops video games, apps, and other softwares, all housed at Louisiana Technology Park, it is clear that this shift of the festival will likely not be the first. Devastated by catastrophic and deadly flooding in 2016, Baton Rouge’s economy took a major hit as some 60,000 people lost their homes. However, things are once again looking up in the area. At the start of 2018, many are predicting a boost in the market now that the city and it’s industries have had time to recover with the current unemployment rate at 5%. In fact, Forbes ranks them as #94 in job growth by with a .09% projected annual job growth. In addition to fostering innovation and improving the economy, Baton Rouge puts forth great effort in improving and maintaining the city’s recreation as well. The city’s downtown area has recently been revived due to the efforts of the Downtown Development District, which has been working for 30 years to improve the cities entertainment, education, cultural amenities, and foster business growth and development in the area. A popular place for locals as well as visitors is the North Boulevard Town Square. Formerly an unusable space with no sun cover in the heart of downtown, the town square is now a favorite location in the city and hosts community events weekly. Although Baton Rouge is seen as the business counterpart to popular destination New Orleans, it has many tourist locations, amazing cuisine, and events year long. For travelers looking for the fun of Mardi Gras, without the price or craziness of New Orleans, Baton Rouge has a large Mardi Gras parade festival as well, the largest being an old Spanish town. If looking for a place to start your company, earn a degree, or just to live, Baton Rouge has many unexpected benefits to offer residents and business owners. Whether you’re an entrepreneur looking to get a start in the Baton Rouge area, or a well established company, Halloo can help you manage your business communication. Find a Baton Rouge area phone number for your business. To search numbers available in area code 225 click here. This entry was posted in Local phone numbers and tagged 225 area code, baton rouge phone numbers by Kathryn Anderson. Bookmark the permalink.